I’ve been a poet for only about a year, so I’m not sure yet if introspection is good — or bad — for the craft. I tend to think it’s bad, since it pulls all of your attention inward and all you end up with a self-indulgent, whining poem. Today I’ve been thinking about my age and the year it is now (geez! 2010!). I remember many very old people saying things like, “I never thought I’d see that as long as I lived!” They were referring to events like the first man on the moon, Obama being president, etc. I’ve been trying to think of some things that would cause me to say that and I can’t come with any (yet). Maybe I’m just optimistic or read too much fiction. World peace: no one hungry; no one hating another because of his idea of that other; more flowers; random dancing; group singing; no acne; no tooth decay (we can put the dentists to work as maybe scupltors); even easier travel — maybe teleportation! 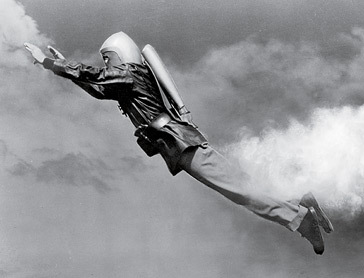 Oh, yeah, and finally my own jet-pack!